The Rock Palm is certainly the most confusing of the Braheas: the stems can be short or tall, thick or thin, solitary or suckering, and the leaves can range from green to glaucous blue. Furthermore, its range consists of N. Mexico right down to Guatemala, with many variations along the way. 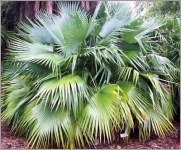 A very tough, drought and frost-resistant, easy-to-grow palm for temperate and subtropical climates. This particular rare variety has beautiful, silvery blue leaves.